SHOULD WE REALLY BE EATING 10 PORTIONS OF FRUIT AND VEG a DAY? FORGET ABOUT 5 A DAY. ACCORDING TO NEW RESEARCH WE NEED 10 PORTIONS OF FRUIT AND VEG A DAY FOR OPTIMUM HEALTH. But do we really need to bother and is it too much to ask? DO WE REALLY NEED 10 A DAY? I know, you’re doing very well on 5-a-day and thought that was all you needed. So why have they increased it? Apparently, the previous campaign of having 5 portions of fruit and veg was chosen because it was seen as a target most people could achieve. The ideal always was 10 a day! You still get loads of benefit from eating 5 portions a day. But the research, by Imperial College London, found that eating more than 800g (10 portions) of fruit and veg a day slashes your risk of heart disease by 24 percent, strokes by 33 percent and cancer by 13 percent. So the more fruit and veg you eat, the more you benefit. HOW CAN I MANAGE 10 PORTIONS? Apparently, two out of three Brits don’t even manage 5-a-day. For some of us, 10-a-day might push our financial budget that little bit too far. And don’t even get started on the time it takes to prep all that veg. But 10 portions isn’t actually that difficult to achieve. One portion is measured as 80g, like a spoonful of peas, an apple, 1 stick of celery or even half a can of baked beans. This portion guide will help. The trickiest part will be making sure it’s different fruit and vegetables for each portion. Oh, and only three of them should be fruit! 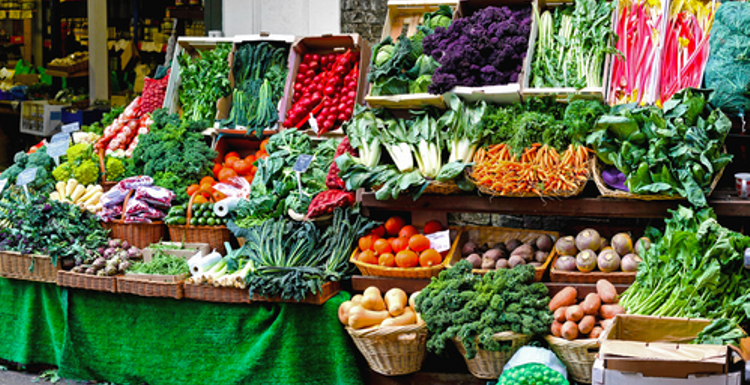 Don’t be disheartened if you can’t afford (or don’t like) lots of fruit and veg. You don’t have to spend a lot: variety is what counts, and grapes are as beneficial as goji berries. Plus, every little bit counts (just like exercise). Get creative with meal preparation: add veg to sauces; eat a rainbow of colours; adopt a more Mediterranean diet; snack on crudités; make smoothies with spinach, avocado and berries. You don’t have to eat 10 portions a day, but if you increase the number even by 2 or 3 you’ll have more energy and be more protected from disease. Now where’s that apple? oh dear, this is my one failing. I am very fussy and don't like much fruit and veg apart from the basics. Anything weird and fancy like avocado - no thank you! So it would be very boring for me to try and eat 10 portions of the same old peas and carrots all the time. I have heard a rather cynical theory that the target has been upped so that people might actually eat some fruit and veg , rather than almost none. I agree that with those portion sizes it isnt really difficult. I am quite surprised that I already manage nearly 10 portions most days. I always have two pieces of fruit for breakfast, at least 2 vegetables in a salad or pitta for lunch, 3 veg with evening meal, and snack on vegetable sticks and dried fruit and nuts in the day. It's not that hard if you like healthy food!